Whether it is for a big meal or simple conversation, the kitchen is a spot that everyone loves to gather. But why have only one kitchen space when you can have two? On those days when the weather is clear and crisp, who wants to stay indoors? 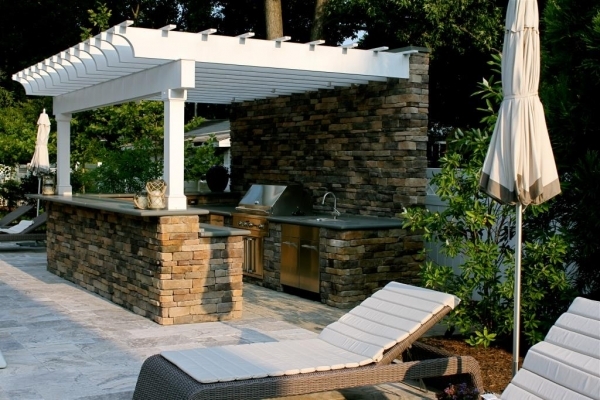 Extend your hospitality outdoors by creating an inviting outdoor kitchen in your backyard. The first thing that generally comes to mind with outdoor cooking is a grill. Grills are now available with many high-tech features such as multiple burners, rotisserie cooker, and even smoke trays that give barbecued meats their smoky flavor. In addition to grill, you will want plenty of counter space for prep work and serving. And extra amenities such as a sink and refrigerator complete an outdoor kitchen both aesthetically and functionally. In addition to building a great area for cooking, make sure to have plenty of seating for family and friends. Create a casual spot for kids to gather with a counter top bar and stools. Add an outdoor dining table with comfortable cushioned chairs for large gatherings. And include decorative accessories and fresh flowers for an inviting space to entertain. If you don’t want to miss the “big game” while grilling outdoors, make sure to include an outdoor entertainment system. There are televisions today designed specifically to withstand the elements outdoors. They not only protect against glare but are made to stand up to all kinds of weather including rain, snow and extreme temperatures. Creating an outdoor kitchen adds an inviting new place to cook and entertain. 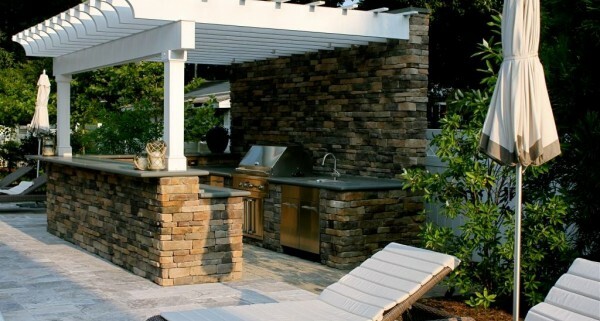 At Shorb Landscaping, our professional team of landscapers and designers can assist you with designing your dream outdoor kitchen. Check out some of our past work at our project gallery. You can call us at 301-897-3505 for a consultation.